NORMAN, OK – October 3, 2013 - Global weather leader Weather Decision Technologies®, Inc. (WDT) has been awarded the Oklahoma City Metro 50 Award from the Greater Oklahoma City Chamber of Commerce for the eighth time. The company, which placed 36 in the overall ranking, accepted the award at the National Cowboy & Western Heritage Museum in Oklahoma City on Monday, September 23rd. "We are delighted to again be the recipient of this prestigious award," said Mike Eilts, President and CEO of WDT. "For the past 13 years, our expert staff of meteorologists have focused on providing state-of-the-science weather detection, nowcasting, and forecasting systems for global deployment in operational environments," said Eilts. "Without our exceptional customers, partners, and these dedicated employees, repeat honors such as appearing in the Metro 50 list would certainly not be possible. "The Metro 50 celebration is one of Greater Oklahoma City's most prestigious events. The metropolitan area's fastest growing, privately owned companies for the year are ranked based on their percentage of annual growth. Qualified companies are required to have revenues of at least $1 million for 2012. Mayor Cornett revealed the ranking of all Metro 50 winners during this dynamic dinner.The Metro 50 Award allows both emerging companies, as well as companies that have exhibited a substantial history as an established business, to be recognized. Metro 50 companies demonstrate positive growth in revenues; growth in the number of employees; creativity/entrepreneurship; and business development through the expansion of facilities, customer base or marketds. 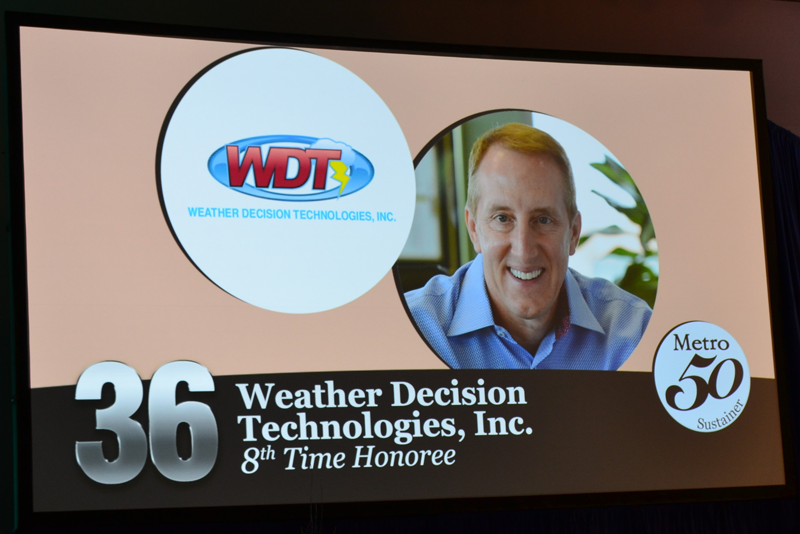 Founded in 2000, Weather Decision Technologies is a high technology leader in the weather industry, providing life-safety applications and weather decision support services and systems to our partners and customers. WDT services provide dynamic, web-based and mobile interactive mapping solutions for the world's leading local media companies. WDT maintains operational offices in Norman, Oklahoma.